Dont dismiss it though. For English teachers, Wordle is far more than just a simple “toy.” Its a great analysis tool, as I reported last year. A post last week on the ReadWriteWeb blog reminded me how wonderful the tool is at providing a snapshot of the key ideas behind a message. 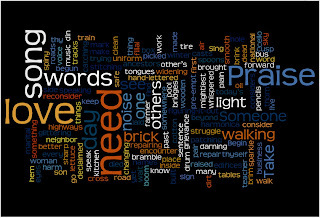 Author Marshall Kirkpatrick shares word clouds for President Obamas inaugural address alongside clouds for George W. Bushs, Bill Clintons, Ronald Reagans, and Abraham Lincolns inaugural addresses. The words alone are only part of the story, but they can point student readers toward the speeches with more information. The Wordle clouds are a remarkable prereading tool. First look at the map with students and discuss the words that stand out. Why would the speaker focus on those words? How do they predict the speaker will use them? What senses of the words will the speaker avoid? As they begin reading the addresses, students can look for the key terms and see whether their predictions were accurate and make note of how key words are used in different contexts within the text. If you have already discussed Obamas address with the class, why not try the Wordle clouds for inaugural poems? There have been four poems written for U.S. presidential inaugurations, and there are a number of resources available for teaching these poems, including an Education World lesson, a Teacher Vision lesson, and a BITs post. Ask students to explore how the words that stand out in the clouds for the poems might predict the themes and symbols that will be developed in the poems. As students analyze the poems more deeply, connect the poets use of repetition and word choice affects the message of the poems. No matter how you use Wordle images, they're a great tool for exploring the ways that writers use words—and if the analysis engages students in a bit of fun, thats okay. Go ahead and call Wordle a toy. That wont stop students from engaging in a good bit of critical thinking! I was attending an NCTE conference and when it happened I was in the elevator with an NCTE colleague and several other hotel guests. We hadn’t gone two floors when one of the guests asked us if we were there for the English conference, and we confessed that we were. The guests began some talk about how English was a difficult subject and so they’d better watch their grammar. Now, we’ve all read about teacher-heroes (maybe even known a few): the professor who took a bullet at Virginia Tech in order to save his students, the teachers in the what is now Ground Zero area of New York City who quietly led their students out of the building and got each and every one home safely, the NCTE/SLATE Intellectual Freedom Award winner who defended the importance of teaching of Brokeback Mountain even when the objecting parent decided to pull a $3 million grant from the school. What no one hears enough about, though, are the heroic acts teachers do as they go about the regular business of teaching their classes. We teachers are everyday heroes who dry the tears of distressed kindergartners and those of distraught 9th graders, who ask the right questions to help a stuck middle school writer get unstuck, who listen to the personal sadnesses in our students’ lives and proceed to offer them through literature a look into the lives of others. We are calm when the fire alarm rings, patient when our lesson plans need to be laid aside to handle an unexpected situation such as the death of a student or teacher, and willing to return each day with fresh ideas and ears open to whatever our students might bring with them. As the TETYC article "Bias and the Teachable Moment: Revisiting a Teacher Narrative" points out, we teachers go home and think about what has transpired in our classes and we change based on what we’ve discovered through this thinking. We do all this without superhero costumes and usually without recognition, yet maybe our daily acts of heroism cause us to exude some sort of “hero-scent” and that’s what the hotel guests recognized when they pegged my colleague and me as English teachers! How have you been a hero lately? This week the National Endowment for the Arts (NEA) reported the first rise in the number of adults reading literature since they began their survey in 1982. In fact, 16.6 million more adults reported reading literature (novels and short stories, plays, or poems) in 2008. And, the most rapid increase was in literature reading by young adults aged 18-24. This same week the National Center for Educational Statistics finally released its 2003 National Assessment of Adult Literacy, reporting that roughly 32 million U.S. adults (nearly one in seven) lack Basic Prose Literacy Skills and aren’t able to read at all or can read only the simplest of messages. What does this mean? How can more people be reading literature while so many other people are “functionally illiterate”? It seems to me—and it’s spelled out in the NCTE/IRA Standards for the English Language Arts and in NCTE’s Definition of 21st Century Literacies —that reading is just one part of literacy. In fact, to be literate today one must read and write; speak, listen, and view; think critically, act creatively and collaboratively; and manage, analyze, and synthesize multiple streams of simultaneous information. When I look at the criteria for the National Endowment for the Arts study, I’m delighted that adults are reading “literature,” but I can’t help but wonder how many more adults might be reading nonfiction, reading webpages, reading images, doing important reading that doesn’t fit under the NEA definition of literature. And adults aren’t our only concern. In "Training Focuses on Improving Literacy,” NCTE president Kylene Beers says, “Our kids just aren't as literate as they need to be." I have to agree. With all they see and hear around them, many kids still have difficulty digging below the surface—deeply “reading” what the world has to offer them. One way we can help is by gearing what and how we teach in class toward helping our students develop high level literacy skills that will serve them now and in the future. NCTE’s 21st NCTE Framework for 21st Century Curriculum and Assessment serves as a good guideline for how we might do this. Literature holds a special place in my English teacher heart. Unfortunately, though, it’s something I have precious little time to enjoy. That’s one reason why I relish Black History Month in February. Every year for as long as I can remember, NCTE has held its own African American Read-In right here in our office. For an hour on the first Monday of February I get to spend time with African American literature, first reading on my own and then listening to the readings of others. It’s usually a quiet time, an emotional time—a time when NCTE staff members feel part of another world outside—and inside—the office. For that hour, those of us who participate get the opportunity to stop to celebrate literature by African-Americans, to get acquainted with books we haven’t read, to share titles, to hear words—to connect with one another as colleagues of literature as well as work colleagues. It’s a once-a-year hour I don’t want to miss. This year I encourage you to hold your own African American Read-In—to spend just an hour with colleagues or neighbors or friends reading and sharing African American Literature. Do this any time in February. No elaborate plans are necessary—there are book and planning suggestions on the African American Read-In website. Maybe right now you'd like to share your plans.